Storm surges associated with severe tropical cyclones are among the most hazardous and damaging natural disasters to coastal areas. 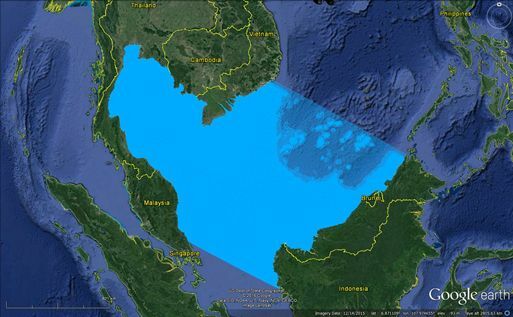 The Gulf of Thailand (GoT) has been periodically affected by typhoon induced storm surges in the past (e.g. storm Harriet in 1962, storm Gay in 1989 and storm Linda in 1997). Due to increased touristic / economic development and increased population density in the coastal zone, the combined effect and risk of high water level and increased rainfall / river discharge has dramatically increased and are expected to increase in future due to climate change effects. 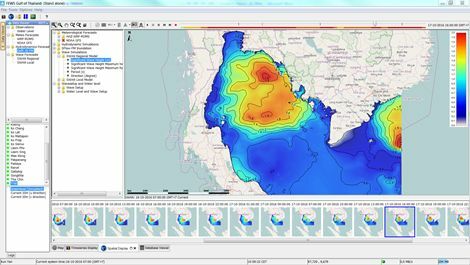 The main objective of the Gulf of Thailand EWS is to provide daily accurate storm surge, wave and wave setup estimates automatically with various data exports possibilities to support this task. It adds a coastal component to HAII’s (Hydro and Agro Informatics Institute) existing practice of providing daily reports on fluvial flood forecasts, used for decision-support in issuing flood warnings for inland water systems in Thailand. Every day, three-day coastal forecasts are now produced based on the latest regional meteorological predictions. Examples are given to illustrate the system’s development and main features, with a focus on decision-support products. 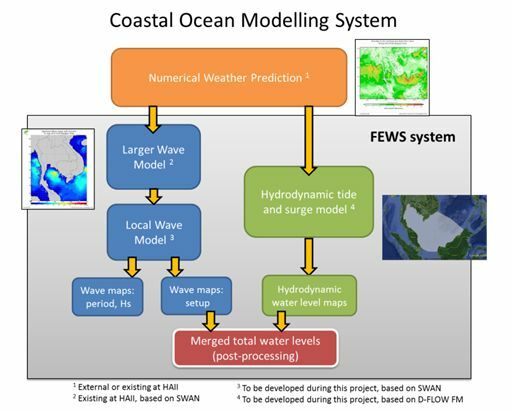 The figure below summarizes the major components of the Modelling System implemented, illustrating how the three models combine to produce the desired water level and wave forecasts. The operational platform is based on Delft-FEWS software, which coordinates all the data inputs, the modelling tasks and the automatic forecast exports including overland inundation in the upper Gulf of Thailand. The hydrodynamic model is based on D-Flow FM module of the Delft3D Flexible Mesh Suite (Delft3D FM), capable of simulating water levels and detailed flows. The regional and the recently-developed local wave model are based on the SWAN model, a third-generation wave model. Major components of the Modelling System (Delft3D FM and SWAN codes). Delft-FEWS was configured to manage the data flow between measurement data provided to the system, the modelling framework applied to run the hydrodynamic and wave forecasts, some post-processing of model output and the export of these forecasts. The FEWS Client is the user-interface that allows the users at HAII to monitor data feeds, produce model forecast at regular intervals / forecast cycles, view the measurement data and run specific tasks. The tasks will also be scheduled with certain time interval to allow automatic running of workflows. The major objective of the model development was to build an unstructured-grid hydrodynamic model capable of representing tide and storm surge at a sufficient spatial resolution, with manageable runtimes to provide a first operational model in HAII’s EWS. The models in the EWS should be of sufficient quality, otherwise warnings are too often unreliable. This new model grid is very large, at about 1,800 km by 1,200 km in size. It has a total of 815,000 computational nodes, and a horizontal resolution between 8000m over deeper waters to 250m along the coastlines. The achieved model characteristics (horizontal resolution and runtimes) are considered very adequate for the envisaged coastal ocean operational system. This first Gulf of Thailand tide-surge model is of sufficient quality, and is ready for inclusion in the EWS to be installed at HAII. The goodness-of-fit values reported show that this model offers a solid base to continue the development. Two wave models have been developed in the course of this project, which were then implemented in the operational system under Delft-FEWS. These two wave models, one regional covering the entire Gulf of Thailand (slightly smaller than the hydrodynamic model) and one local covering the southern part of Thailand, are based on the SWAN code developed at the Delft University of Technology. The larger domain has a coarser grid, at 1.5km, while the smaller domain is finer, at 0.3 km resolution. Illustration of these model extents and of some results are shown below, as screenshots of the FEWS viewer. The development of these two SWAN models was carried out by HAII researchers, with support from Deltares wave specialists. • Automatic import of WRF-ROMS provided by HAII. A 7-day meteo forecasts (i.e. WRF-ROMS) is imported to FEWS-GoT every 24 hours when it is available. • Water level forecasts simulated by Delft3D FM: 1-day hindcast and 3-day forecast of water levels (including maximum) are provided by Delft3D FM in FEWS-GoT. • Wave output simulated by SWAN: 1-day hindcast and 3-day forecast of wave outputs provided by both SWAN regional and local models, where the local SWAN model is ‘nested’ in the regional SWAN model. • Static inundation modelling; three-day forecasts are calculated based on water level forecasts near the Chao Phraya estuary (see below). • Wave setup forecasts are calculated for the entire Thai Coast. • Forecast in scalar timeseries; Water level hindcast and forecast scalar timeseries in 21 locations with proper model states handling. Storm surge associated with severe tropical cyclones is among the most hazardous and damaging natural disasters to coastal areas. The Gulf of Thailand has been periodically affected by typhoon-induced storm surges in the past. With the overall aim to better predict and deal with such flooding events, the Hydro and Agro Informatics Institute (HAII) has started the project “Ocean Modelling and Early-Warning System for the Gulf of Thailand” together with Deltares in order to develop and implement this Early-Warning System. The newly-developed hydrodynamic model characteristics (horizontal resolution and runtimes) are considered very adequate for the envisaged coastal ocean operational system, and the overall quality of this first Gulf of Thailand tide-surge model is sufficient for inclusion in the EWS installed at HAII. Several beneficial impacts are expected from this EWS, among which to contribute to UNDP’s 2030 Agenda for Sustainable Development / sustainable cities and communities.